Every Saturday at noon, Historicist looks back at the events, places, and characters—good and bad—that have shaped Toronto into the city we know today. 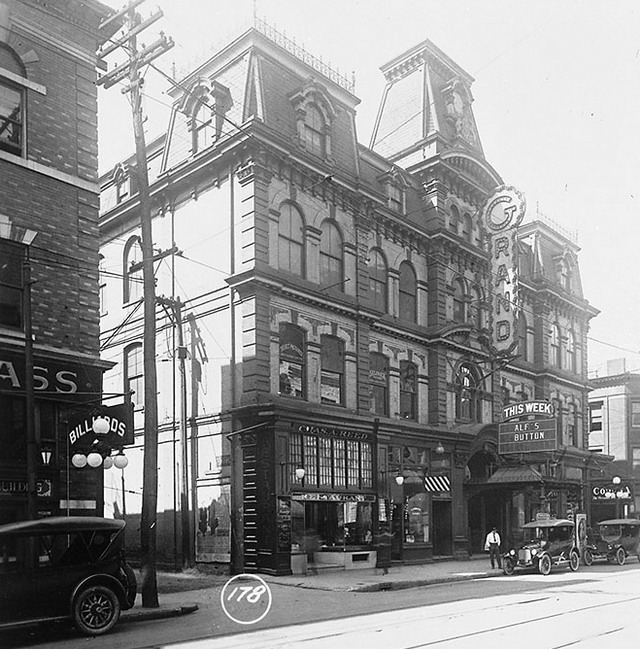 Grand Opera House, 11 Adelaide Street West, 1913. City of Toronto Archives, Fonds 200, Series 372, Subseries 41, Item 516. For several generations, until at least the 1960s, a running joke for Torontonians was that the foundation excavations for each new building might finally uncover the long-lost remains of Ambrose J. Small. A millionaire who made his fortune in the theatre business based out of the Grand Opera House on Adelaide Street, Small’s baffling disappearance in late 1919 became one of the country’s most legendary unsolved mysteries. In life, Small seemed an unimpressive public figure, but investigations revealed unsavoury elements in his character that fuelled salacious nationwide newspaper headlines that made him, after his disappearance, larger than life. 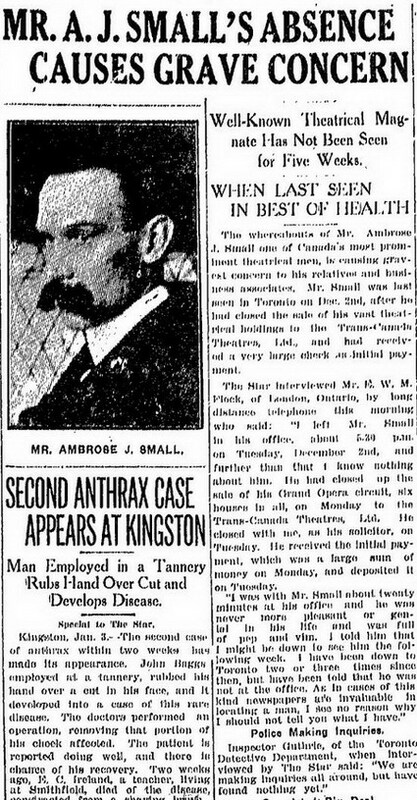 Image from the Toronto Star, January 3, 1920. Ambrose J. Small was born in Bradford, Ontario, in 1867. His father was a proprietor at the Grand Hotel on Toronto’s Adelaide Street West. Seeking to instil in his son a tireless work ethic, the elder Small convinced the owner of the Grand Opera House, located across the laneway from the hotel, to give his son a job in about 1884. Demonstrating business acumen, Ambrose Small rose quickly from assistant treasurer to treasurer. By 1889, he had fallen out with the Grand Opera House’s manager, Oliver Barton Sheppard, and moved down the street to manage the Toronto Opera House. As manager and part-owner, he gained insight into how the international touring and booking syndicates that brought plays and vaudeville acts to theatres across North America worked. And so when Small purchased a number of theatres in cities across Ontario, beginning with Toronto’s Grand Opera House, these formed the nucleus of a thirty-four-theatre circuit in which he—not New York syndicates—controlled the bookings and touring shows. Astutely sensing the sorts of shows that would appeal to the public, Small specialized in staging scintillating plays that imagined the sexual lives of single women. At the time of his disappearance, the Grand was showing Revelations of a Wife, a tawdry melodrama. His other productions explored similarly racy themes with titles like Bertha the Sewing-Machine Girl or School for Scandal. Such near-burlesque entertainments raised eyebrows among puritan Toronto’s elite, but they also certainly filled seats. He developed a reputation, according to Kathleen D. J. Fraser in the Dictionary of Canadian Biography, as a “brazenly unscrupulous” businessman. But along the way, he amassed a small fortune and served as president of the Canadian Theatrical Managers’ Association. “Ambrose Small did not have the appearance of a wealthy businessman,” according to his business associates depicted in Fred McClement’s The Strange Case of Ambrose Small (McClelland and Stewart Limited, 1974). “He could never have fitted the description of an impressive executive. Small was five feet six, weighing not more than 140 pounds. His eyes were bright blue and he had a reddish complexion.” His most distinguishing feature was a droopy, walrus moustache. Nevertheless, not only was he a successful businessman, he was also known for his prodigious appetite for women and for his frequent dalliances with chorus girls. Image from the Globe, August 14, 1920. So it came as some surprise that, on November 6, 1902, Small married Theresa Kormann, the buxom heiress of the Kormann Brewing Company family. Well-educated and refined, she spoke several languages and was an accomplished musician. Her wealth certainly helped Small establish and expand his theatrical empire as his business partner, but there appears to have been genuine affection between the two. As a reflection of their wealth and status, they lived in a massive sixteen-room mansion at 56 Glen Road in Rosedale. To the public eye, the couple were upright citizens, among the elite of Toronto society. He was a member of exclusive organizations like the Empire Club, Canadian Club, and the Yacht Club. Likewise, she was a member of the Women’s Canadian Club, the Toronto Ladies’ Club, the Musical Club of Toronto, the Women’s Art Association of Toronto, as well as an officer in the I.O.D.E. She, a Catholic, was a philanthropist who gave regularly to Catholic charities, such as the St. Vincent de Paul children’s orphanage. Her husband, a Protestant, sometimes accompanied her to make presentations, even though he had at least once grumblingly professed that he had no use for either Catholics or children. Seeing declining returns on touring shows but increased costs of productions, the Smalls grew restless with the theatre business after the First World War. 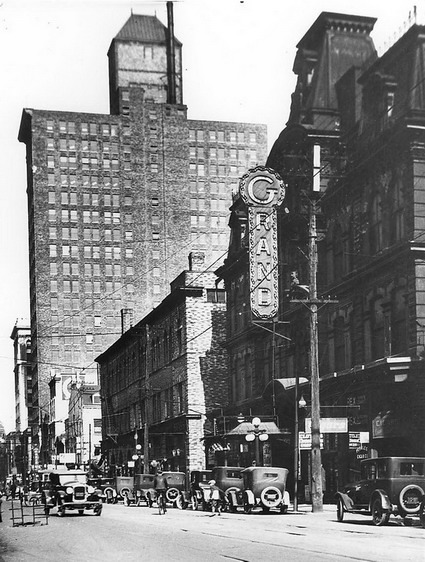 On a brief business trip to Montreal in the fall of 1919, Small negotiated a deal to sell his chain of theatres to the Trans-Canada Theatres Limited for $1.7 million. On December 2, 1919, the purchasers visited to Toronto to finalize the deal. In a meeting, Small accepted a million-dollar cheque (with the balance to be paid in instalments over the years). The transaction concluded, Small sent his wife to deposit the cheque at the Dominion Bank’s main branch at King and Yonge while he ran errands—buying her a Cadillac, a fur, and jewellery. They lunched together before Small returned to his office at the Grand Opera House to share a celebratory cigar with his lawyer, E.F. Flock. Flock stepped out into a snowstorm at about 5:30 p.m. to catch an evening train, but Small was never seen again (a newsboy’s claim that Small had bought a paper from him was later refuted as mere hunger for publicity). Adelaide Street, south side, looking east from Bay Street, 1924, by William James. City of Toronto Archives, Fonds 1244, Item 7069. So it was four weeks before Small was reported missing. In early January, police began their investigation and newspapers broke the story. On the strength of a reward for information—fifty thousand dollars to locate him alive; fifteen thousand dollars for his body—offered by Theresa, the story went international. As investigators interviewed Small’s few confidants and his associates, the underside of the theatre magnate’s character emerged, providing officers with suggestive leads to follow and newspapers with titillating stories to stimulate their readers’ imaginations. From the outset of his career, at least a portion of Small’s fortune had been amassed through under-the-table bookmaking operations. He continued to be a habitué of illegal gambling dens and, according to the Dictionary of Canadian Biography, “a reckless gambler at racetracks,” wagering vast sums of money on races across North America. He was also rumoured to be involved in the fixing of races, and so—although he always paid off his debts when he lost—he gained enemies in the racing and gambling worlds. Detectives also uncovered what Theresa had initially sought to keep quiet: Small’s “international reputation for sexual prowess,” as Fred McClement put it. Police discovered a secret room at the Grand Opera House, outfitted with thick, sound-muffling drapery, a lush oriental rug, a well-appointed bar, and an enormous bed. Small had apparently had the chamber—the venue for countless liaisons—constructed without his wife’s knowledge while Theresa was travelling abroad. Nevertheless, police could not implicate any of Small’s female acquaintances or gambling cronies in his disappearance. Depending on the source consulted, Small either cared for his employees—taking extra effort to ensure their continued employment after the sale of the theatres—or he treated them with utter derision. 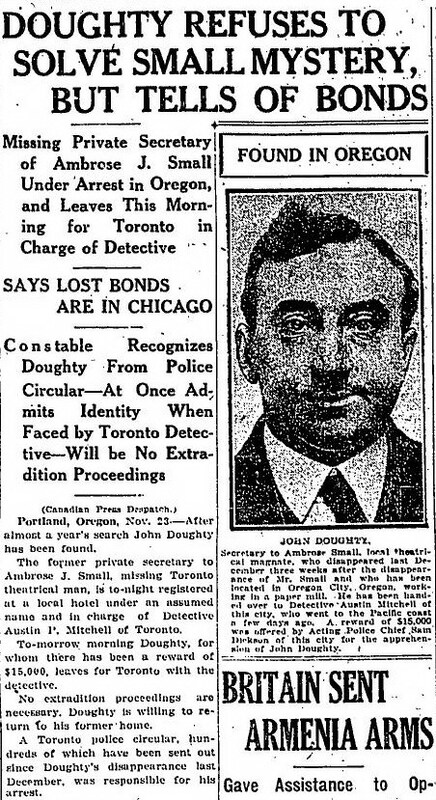 Rumours of the latter were strengthened by news that Small’s long-time secretary, John Doughty, had himself disappeared, absconding with $105,000 of Small’s bonds. Tracked to an Oregon lumber camp, Doughty was brought back to Toronto to stand trial. But authorities succeeded only in prosecution for theft; the charge of conspiracy to kidnap was dropped. Image from the Globe, November 24, 1920. For months, as Mike Filey notes in Toronto Sketches: ‘The Way We Were’ (Dundurn Press, 1992), speculation about Small’s fate was rampant. If he’d been murdered (but there’d been no theft other than Doughty’s) what was the motive? If he’d been kidnapped, why had there been no ransom demand? If he’d wilfully disappeared, why had he made no apparent attempt to take any of his fortune? Some suggested he’d been buried in the city landfill. His theatres were scoured for clues, with the walls opened up and the floor boards pried up. The Rosedale Ravine was explored by police numerous times—even as late as 1965—in search of a shallow grave. Police departments the world over confirmed that Small was not located within their city limits. Nevertheless, people claimed to have seen Small in South America or living it up in France. A night watchman at London’s Grand Theatre claimed to have conversed with Small at the theatre on the night of his disappearance, giving rise to the claim that his ghost haunts the theatre. Magician Harry Blackstone, a close friend of Small’s and a regular performer on his circuit, was so adamant that he’d seen Small across a crowded Tijuana casino that he signed an affidavit to that effect. A telephone caller who declared to Star reporters that he was Small turned out to be Charles Churchill, an escaped convict in Wisconsin. Some, of course, cast a suspicious eye upon Theresa. Rumours swirled that she and a lover—possibly Doughty—had burned her husband’s body in one his theatres’ furnaces. She’d had to have him officially declared dead in order to settle his estate, which—like her own—she planned to donate to the Catholic Church. The probity of Protestant Toronto was incensed. Small’s sisters, Mary Florence Maude and Gertrude Mercedes, challenged Theresa in court, while—spurred by the Orange Order—a war of words raged in the newspaper. In the sectarian version, Small was an upright citizen above reproach; Theresa was slandered as a corrupting jezebel, who had likely committed the murder herself. She eventually prevailed on the question of inheritance in court a decade later and died shortly afterward. But the doubts about her innocence persisted. Ontario Provincial Police Inspector Edward L. Hammond even accused his counterpart in the Toronto Police, detective Austin Mitchell, of purposely covering up Theresa’s involvement in a 1936 memo uncovered by an aspiring documentary filmmaker. Toronto Police officially closed the Ambrose J. Small investigation in 1960, although the missing persons case was never solved. But in the years after his disappearance, the theatre magnate’s legend grew with the appearance of countless articles, books—including a walk-on but fictionalized role as “the jackal of Toronto’s business world” in Michael Ondaatje’s In the Skin of a Lion (McClelland and Stewart, 1987)—and even a radio play. Although the mystery of Small’s disappearance lacks a solution and the story lacks a satisfying ending, this absence of finality has ensured that Small’s legend has persevered.